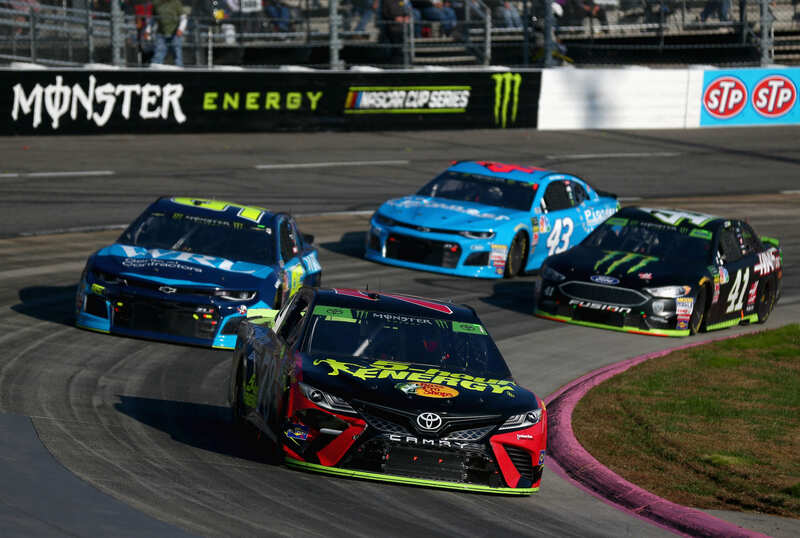 Martin Truex Jr and Joey Logano were in a battle for 10 laps at Martinsville Speedway. In the course of that battle, Truex touched Logano’s back bumper, one time. Instead, Truex moved to the bottom and tried to work by clean. Lap after lap, Logano would pinch of the corner exit of Truex. Logano would run high in the middle, almost diamond the corner. Logano would come off the corner straight and with a lot of momentum. Then, he would pinch Truex down at the same time to make his life difficult. Each time he did that, Logano got into the right front fender of Truex. On the white flag lap, Logano let him have the position. He then followed in behind him through turn one. Heading into turn three, all hell broke loose. After Truex just worked by Logano as clean as a whistle, Logano roughed him up in the final corner. They banged fenders and sent sheet metal flying, all the way to the start finish line. Following Martinsville Speedway, Martin Truex Jr was seeing red. He stood by he torn race car and hinted at payback for Joey Logano over the loud speaker. “He’s not going to win it. Promise,” Truex Jr said after the race. Payback would have been interesting coming from Truex. Mostly because Truex is the kind of driver that wouldn’t even get into Logano to win a race. But, the plans have shifted. Mostly because Truex doesn’t even remember what he said in the post-race interview. “I mean, right now our plan is to make it to Homestead and race for the championship,” Pearn told SiriusXM NASCAR Radio, when asked about a possible retaliation. “I think the best way to keep them from winning the championship is win it ourself. It’s kind of like a ‘beating them on the scoreboard’ mentality, so I think that’s our plan at this point,” Pearn stated. At the end of the season, Furniture Row Racing will be shutting the doors. Yet, the team has found themselves in another championship race. “Everybody’s just proud of their effort. 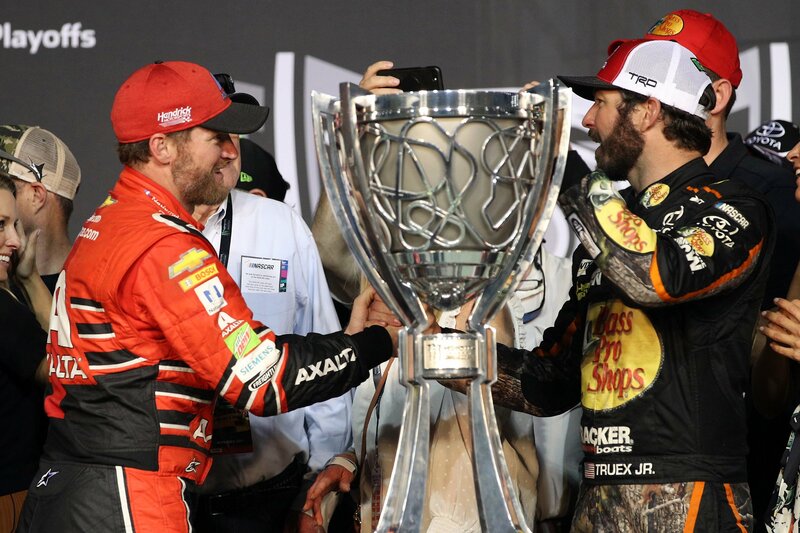 Everybody, every second breath, wants to count us out of it, and we were able to keep the intensity up and keep bringing good cars,” Pearn told SiriusXM. In other words, the payback that was hinted, was an off the cuff comment. Dale Earnhardt Jr spoke to Martin that night. “I was just really surprised that Martin drove him as clean as he did,” Dale Earnhardt Jr said on the Dale Jr Download of the race at Martinsville Speedway. Martin Truex Jr has a lot of similarities to Dale Earnhardt Sr. They talk similar. And when the race is over, each of them could be found in a deer stand throughout the week. Martin Truex Jr and Mark Martin are one in the same. For those that don’t know, Mark Martin was the kind of guy that would wave people by before he even got to them. In his mind, it didn’t make sense to hold people up and burn off your own tires to do it. Knowing full well they’re going to get by anyway.